We would never be so déclassé as to relentlessly brag about how we were trendsetters by opening up in the Seaport neighborhood in 1998—long before everyone was doing it. However, we are more than happy to welcome all of our chic, new neighbors with each ribbon cutting that seems to happen on a daily basis. 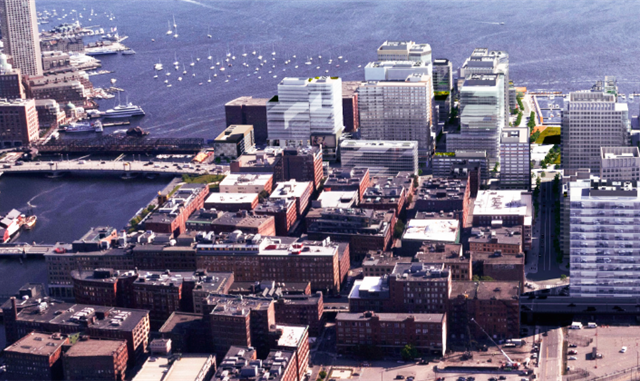 One we are particularly elated to see comes from this week’s news of Seaport Square’s $800 million new phase taking shape literally around the corner. What was originally envisioned as two towers with little ground-level activity has been resubmitted with now three towers of varying height and a “center destination courtyard” of destination retail development. 125,000 square feet of new retail and restaurant space on top of the nearby One Seaport Square’s sprawling shopping hub currently under construction? Blink and we’ll be Newbury Street on the water. On top of further activity to our waterfront boulevards, each of these developments bring much-needed housing to the city. Now if only we can do something about that long-awaited grocery store…Santa forgot to bring us one of those.